Your new fish should be kept in a separate, isolation tank for at least 2 weeks. driftwood, decorations or other fish). 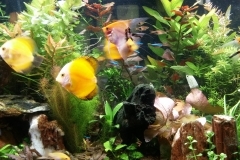 After two weeks, When the fish are showing no signs of stress or disease, they can be moved to their permanent aquarium. CHANGE 40% OF THE WATER DAILY FOR THE FIRSTWEEK AND THEN EVERY OTHER DAY FOR THE SECOND WEEK. It is urgent that you unpack your fish as soon as possible. Float the bag in the isolation aquarium where they are going to stay. DO NOT open the bag at this time! You may find that you need to remove some of the aquarium water to prevent it from overflowing when the bags are placed in the aquarium. If necessary, remove some aquarium water into a clean plastic bucket or other food safe receptacle. Be sure the container for excess water does not have any reside from household cleaners or other potentially toxic chemicals, as you will use this water to refill the aquarium later. Allow the bags to float for at least 45 minutes to allow temperatures to slowly equalize (longer if necessary). Open the fish bags only when you are ready to immediately put them into your aquarium. DO NOT put any water from your aquariums into the bags or vice-versa! Avoid netting as much as possible. Gently pour off most of the water from the bag thru a net. Then release the fish from the bag directly into the aquarium. Another good method uses a smooth plastic spaghetti strainer with small holes. Gently scoop or release the fish into the receptacle, drain the water and place the fish immediately into the aquarium. Large specimens can often be simply hand placed into the aquarium. If these methods are not applicable, place a large net over the top of a clean bucket with enough water to cover approximately a third of the bottom of the net. Open the bag and carefully pour some of the fish into the net and immediately place them directly into the aquarium. Try to avoid a net full of fish as they will ball up in the net, and the ones underneath can be damaged from compression and friction. Remember that water from the bag may react with the water from the aquarium, and could be very harmful. Never mix bag and aquarium water! Sometimes during shipping, fish lie at the bottom of the bag and appear dead. “Playing opossum” is a common animal stress behavior. Carbon dioxide also acts to tranquilize the fish. 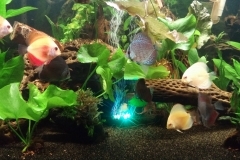 Even if the fish look like they are mostly dead, put them into an aquarium as outlined above. Watch their mouths and gills for 5 minutes. If there is no movement of the mouth or gills for a full 5 minutes, it is dead. 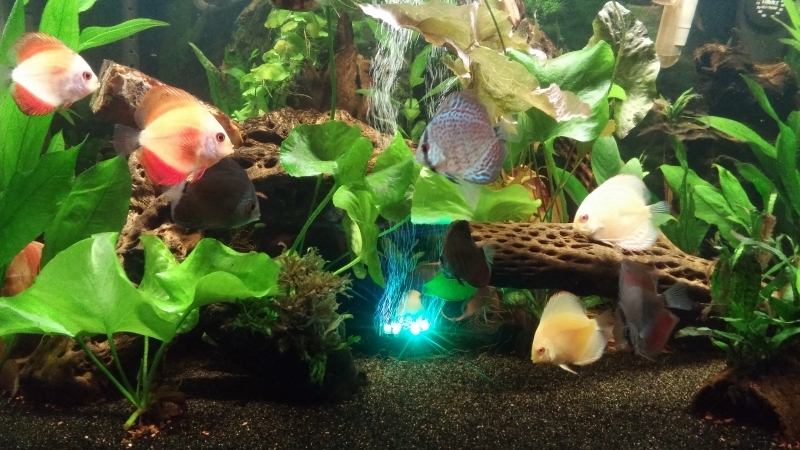 Leave the aquarium lights off to further reduce stress, and leave them alone. You will be amazed how clean water and stress reduction help! One of the reasons fish are able to be shipped long distances in closed bags is because the pH in the shipping water drops, making the ammonia non-toxic. The carbon dioxide acts as a tranquilizer. The moment the bag is opened, and exposed to the outside air, carbon dioxide escapes, the pH of the water immediately begins to rise, and ammonia becomes deadly. Fish tissue damage will then occur very quickly. 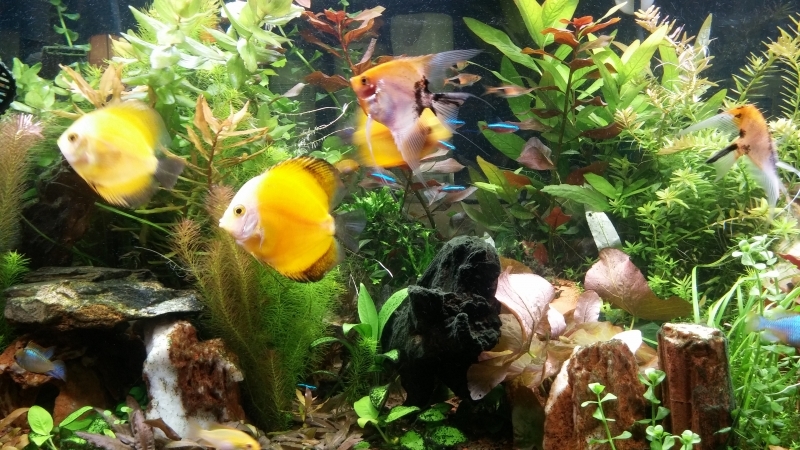 NEVER add water from a shipping bag into your aquarium, as you do not want all that harmful ammonia in your aquarium. NEVER add water from your aquarium into the shipping bag. Acclimate the temperature by floating the bag in the aquarium water, and then immediately open the bag and release the fish into the aquarium, minimizing the introduction of the bag water. 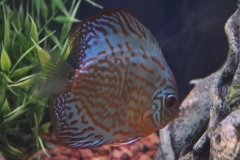 DISCUS****VERY IMPORTANT*** ***PLEASE BE PATIENT**** YOUR DISCUS WILL NOT SHOW THEIR FULL COLORATION FOR SEVERAL DAYS !! THEY WILL START TO GET THEIR COLORATION IN A FEW DAYS AND SHOULD HAVE THE FULL COLORATION FOR THEIR AGE WITHIN ONE MONTH. 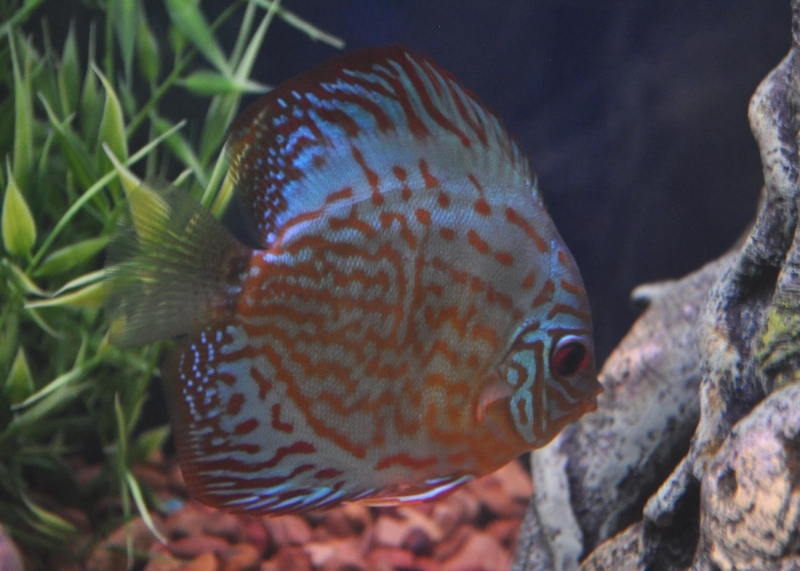 MOST DISCUS DO NOT SHOW THEIR FULL AND FINAL COLORATION OR PATTERN AS JUVENILES AND WILL NOT UNTIL THEY ARE MATURE ADULTS (AROUND 5″). 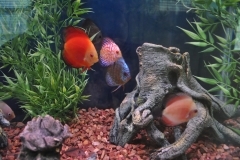 DISCUS WILL OFTEN LAY ON THEIR SIDES FOR A FEW HOURS, OR EVEN SOMETIMES A COUPLE OF DAYS, AFTER THE STRESS OF SHIPPING. CHECK THEIR GILLS FOR AT LEAST 5 MINUTES TO MAKE SURE THEY ARE NOT BREATHING BEFORE GIVING UP ON THEM! DO NOT FEED YOUR DISCUS FOR 24 HOURS AFTER YOU RECEIVE THEM. DO NOT PUT ANY BRIGHT LIGHTS ON THEM FOR THE FIRST DAY. 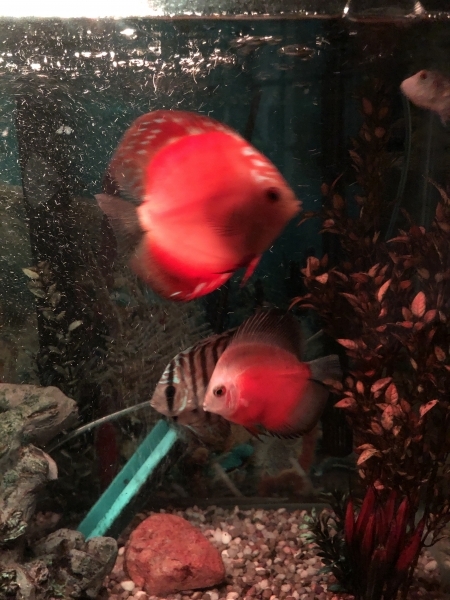 FLOWERHORN***VERY IMPORTANT***FLOWERHORN ARE AGGRESSIVE, SO MAKE SURE THAT THEY ARE PUT INTO A STERILE ISOLATION TANK FOR TWO WEEKS WITH PLENTY OF HIDING PLACES. LARGE PCV TUBES CUT TO ABOUT 6 INCHES MAKE GREAT HIDING PLACES. PLASTIC BAGS CUT INTO STRIPS MAKE GREAT DISTRACTIONS. PLEASE REMEMBER THAT MOST JUVENILE FLOWERHORN ARE GREY WITH NO HUMP (KOK) AND MOST OF THE STRAINS LOOK PRETTY MUCH THE SAME AS JUVENILES. MALES WILL START TO GROW THE KOK AT AROUND 4 INCHES. THEY WILL START TO PUT ON THEIR COLORATION AND PATTERN AT AROUND 4 INCHES, BUT WILL NOT HAVE THEIR FINAL COLORATION UNTIL MATURE. IT IS OK TO FEED FLOWERHORN 2 HOURS AFTER DELIVERY. 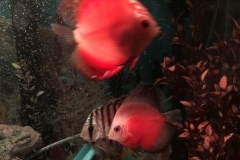 FLOWERHORN SHOULD NOT BE KEPT WITH DISCUS OR ANGELFISH.